Author: Wiegand Jahn. Series edited by: Irmtraud Stellrecht. 16 pp. Roman, 294 pp. Indus Kohistan is a region on both sides of the Indus Canyon in the Pakistani North West Frontier Province which was integrated in the Pakistani political system as a district during the construction of the Karakorum Highway in 1976. The population consists of various language, territory and descent groups, of which the latter are allocated in turn to distinct status groups. Shin is the term for descent groups of high status and prestige who constitute the well-defined majority of the population in most parts of Kohistan. The present analysis is limited to the relations between agents and groups of the Shin. The majority of the 600.000 people living in Indus Kohistan have their residences in the Indus tributary valley and live on traditional subsistence economy: agriculture and highland pasture farming. But during the last two decades, a minority has settled around newly emerging bazar places at the Karakorum Highway and quit the traditional subsistence economy: They work as civil servants in the governmental departments, as teachers in schools or as businessmen. The focus of this analysis lies on members of this economic minority who are nevertheless closely connected, socially and politically, to the majority of the tributary valley. The concrete subjects of the case study are two households in the “double town” Dasu/Komila which is the political and economic center of the district. The study bases upon data that have been collected during a 16 months ethnographic fieldwork between 1998 and 2000. Two thematic focuses can be pointed out: On the one hand, it is exposed that “friendship” in a traditional segmentary society plays a vital role in central fields of social life too. In this context, “friendship” is defined as a form of interpersonal relationship which is based upon voluntariness and choice and ranges from egalitarian to the hierarchical organization of patron-client-relations. With this special focus, a one-sided perception – to date prevailing in anthropology – shall be expanded, which says that in traditional and/or segmentary societies kinship and descent only (in Indus Kohistan: strictly patrilinear descent groups) have structured how agents behave ever since. On the other hand, friendship is analyzed as a relationship of power. The study of power refers to concrete operation levels. In this context, power is understood as the ability to influence other people’s actions. The point of reference is the experienced daily routine of “average” agents and not the actions of prominent, declaredly “powerful” individuals. 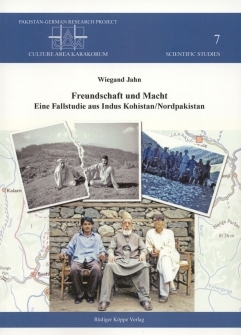 To conclude, friendship in Indus Kohistan is much more than a peripheral social phenomenon. The evidence is against the long standing conviction in social anthropology that in traditional societies only kinship is of real importance, leaving only limited, if any, space for friendship. This insight of the present study corresponds widely with recent fieldwork-based research results predominantly carried out in African societies (Grätz/Meier/Pelican 2003). However, this does not mean that the time has now come to simply put old convictions aside and propagate the dominance of bonds of friendship over those of kinship in traditional societies. Moreover, the time has come to pay more careful attention to the overlappings and interim zones between these social domains, be it in Western or in non-Western (traditional) societies.